In your experience, what usually happens just after a talk, when the floor is opened for questions? A moment of awkward silence? A flurry of hands in the air? A question asked without a raised hand? Whatever ensued, one thing was (statistically) quite likely: it was a male who asked the first question. If you’ve thought that a lot of the questions asked after a talk were by males, you’ve made a perceptive—and accurate—observation. In 2014, a team of astronomers headed by James Davenport created an informal survey through which AAS 223 attendees recorded the gender of the speaker and of every questioner. While the survey only included male and female gender identifications, the authors recognized that a gender binary was false and marginalized those who didn’t identify with the two choices, and solicited feedback on how to address this limitation. They found that about 34% of those who’d registered for AAS 223 were female, and among the talks given at parallel sessions, females were well represented (making up about 31% of the talks). However, although males made up about 66% of those who registered for the conference, they asked 76% of the questions. The authors found other intriguing correlations. It appears the gender of the speaker doesn’t affect the gender ratio of questioners—males asked 74% of the questions after a talk by a female speaker, and 77% of the questions after a talk by a male speaker. As for the gender of the session chair? The gender ratio of the session chairs roughly matched that of those that attended AAS 223: 29% were female, and 71% were male (see Fig. 1). In sessions with female chairs, males asked 66% of the questions—matching the male attendance rate—and asked 80% of the questions in sessions chaired by males. Under the caveat that the sample sizes were small, the authors concluded that the gender of the chairs made the biggest difference. Investigating the reason for this trend was not feasible given how small their data set was, and the authors only put forth one example explanation: male session chairs may tend to ask the speaker a question. Figure 1. The impact of the genders of the speaker and chair on the gender ratio of questioners. 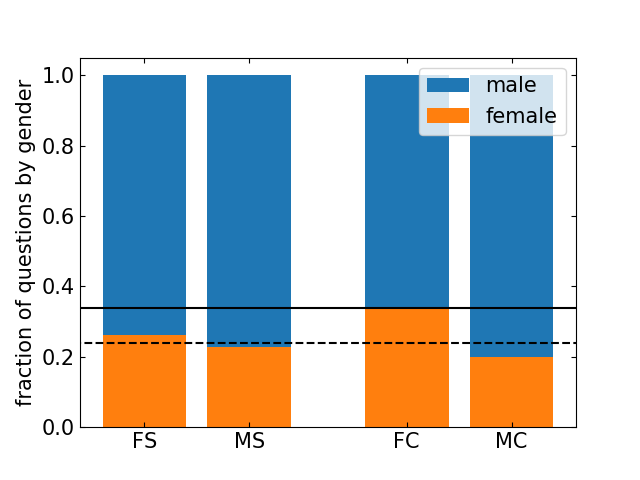 The two bars on the left show the gender ratio of those who asked questions to female speakers (“FS”) and male speakers (“MS”), while the bars on the left are the ratios under female chairs (“FC”) and male chairs (“MC”). The solid black line denotes the gender ratio of AAS 223, while the dashed black line denotes the gender ratio of all questioners. The gender of the speakers did not make a large difference in the gender ratio of questioners, but the gender of the chairs did. Figure generated from data in Davenport et al. 2014. This effort inspired similar studies at different conferences. A group of astronomers in the UK led by Jonathan Pritchard performed a similar study at the UK’s equivalent of the AAS meetings: the 2014 National Astronomy Meeting (NAM2014). Sarah Schmidt led a similar study of questioners at a specialized conference: the 2014 and 2016 Cambridge Workshops on Cool Stellar Systems and the Sun (C18 and C19; also known as “Cool Stars” for short). Both groups also found that women asked 10% fewer questions than expected based on the gender ratio of attendees, suggesting that this phenomenon may be widespread in astronomy. However, both Prichard and Schmidt didn’t find that the gender of the chairs affected the gender ratio of questioners at NAM2014 nor C18 and C19 as much as it did at AAS 223. Prichard (and Schmidt, though the result was not statistically significant) found one intriguing new finding: males are disproportionately more likely to ask the first question (at NAM2014, they were 6x more likely to, asking 86% of first questions). However, females are increasingly likely to ask questions as more questions are asked. For the 4th-7th questions, the gender ratio of questioners were about equal to the attendance rates (see Fig. 2). Figure 2. Females tend to ask more questions later. The fraction of male and female questioners are shown for the 1st, 2nd, etc. questions asked after each talk. The first question is predominantly asked by males (86%), but later questions approach the gender ratio of those who attended, which is shown by the green horizontal line (28% female). The blue horizontal line shows the overall gender ratio of all questions asked during the conference (18% female). Figure from Pritchard et al. 2014, who studied NAM 2014. Another intriguing finding in all three studies was that female speakers were asked more questions than male speakers. The reasons for this are also unclear—did male questioners think that female speakers needed to be interrogated more? Do female presenters tend to create an environment that’s more inviting of questions? Given the lack of data, it’s difficult to say why these trends exist with much confidence, but there are some possibilities that have been floated. Could it be because of seniority? It’s been shown that those who have more seniority are more willing to ask questions. Schmidt pointed out that the fraction of women who asked questions (~20%) matched the fraction of women members of AAS who were born before 1980. Prichard points out studies of the psychology of asking questions that show that males generally dominate in discussions. In addition, females may be discouraged from asking questions from fear of being perceived as dominating (even if they participate a similar amount as males), or possibly from differences in criticisms from teachers that, over time, cause females to be less confident, and males over-confident, in their respective abilities. These studies also indicate ways in which the format of question and answer sessions could be modified to encourage more questions from females: for chairs to make sure talks end on time so that there is sufficient time for questions; to allow at least 4 questions so females more comfortable with asking later can have a chance to ask; and not choosing the first person to raise a hand to give others a chance to ask, and giving priority to females for the first question, among others. With these small changes, we can get one step closer to a more inclusive environment for scientific exchange during conferences. Ultimately, more studies are needed in order to untangle the roots of the trends that have been uncovered. Davenport has continued to collect data on questioners at subsequent AAS conferences—check out his group’s latest results here. If you’d like to spearhead a similar study at a conference you’re attending, Davenport has also provided the resources to do so on his github page.